Keeping up to date with the current recommendations for fruit and vegetable intake can be a bit confusing. In the US the “official” recommendation, using the My Plate formula, is that half of your plate be made up of fruits and vegetables, with that half being comprised of about 40% fruit and 60% vegetables. 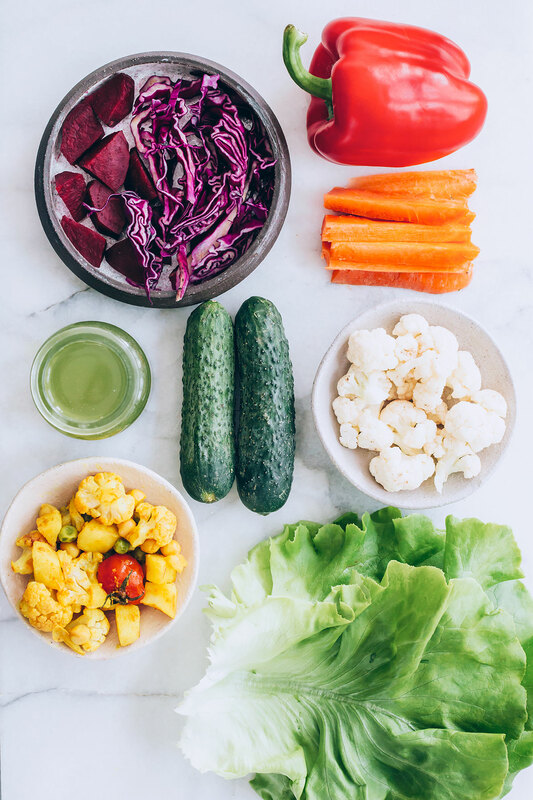 If you go deeper into the guidelines you’ll find recommendations for vegetable consumption based on age, with adult men being prescribed 3 cups and adult women 2.5 cups of vegetables per day. In the EU the recommendation is for adults to consume a minimum of five portions totalling about 400 grams of vegetables, which is just shy of one pound per day. Depending on what your diet looks like on an average day, that may sound like a lot or a little, but here’s a startling fact: very few people actually meet the minimum daily recommendation for fruit and vegetable intake. For a long time I smugly thought that I ate a LOT of vegetables. And frankly, compared to the average eater, I probably do. However, when I was doing my masters degree in nutrition, as a part of a research and assessment techniques course that I took, we were required to weigh and record everything we ate or drank for three days. I assumed that my vegetable intake would be WAY over the recommended daily intake, but I was surprised to find that it was about 500 grams on average, meaning I was eating approximately one extra serving of vegetables each day. My main takeaway from that exercise was the realization that practically everyone could benefit from finding ways to include extra vegetables into their daily diet. Although five servings of vegetables a day is often used as a benchmark, many nutrition and healthcare experts believe we should be aiming higher, for more like 8-10 servings of fruits and vegetables per day. Adding extra vegetables to your diet provides extra dietary fiber, lots of vitamins, minerals, and antioxidants, helps keep you regular, may help lower cholesterol, and reduce the risk of heart disease and some cancers. Here are some of my go-to ways for bumping up my daily vegetable consumption and reaching that 8-serving per day goal. Smoothies are a great way to get extra veggies into your diet. I like to add 1 cup of frozen cauliflower and 2 cups of leafy greens to just about every smoothie I make. I’ll also throw in celery, fennel, cucumber, zucchini, or red pepper, depending on the kind of smoothie I’m making. Some of those you can taste more than others, so you have to decide what’s right for you. 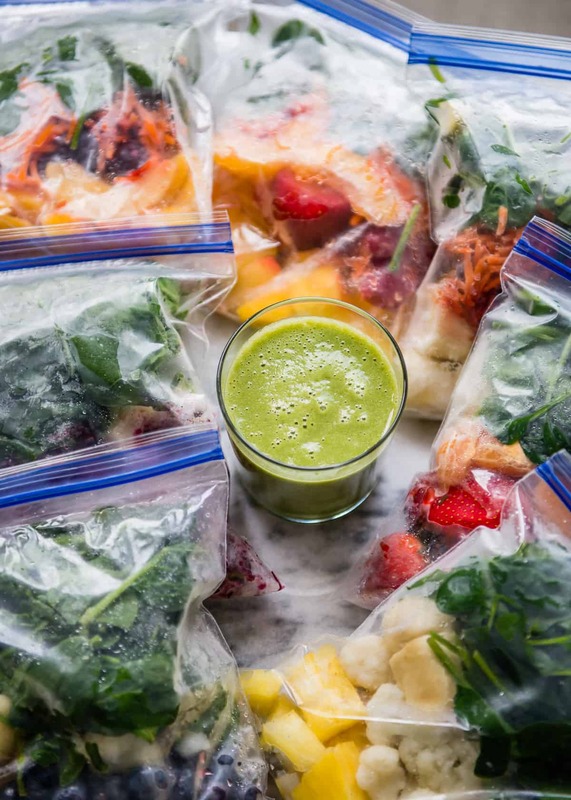 If mornings are hectic in your household, these smoothie packs will make breakfast a cinch. Another way I like to add extra veggies into my morning is with a breakfast salad, or with a veggie-packed omelet. I also love doing some simple scrambled eggs (or a tofu scramble) with a side of wilted greens. And greens really cook down a lot, so you can take an entire bag of baby spinach and throw it in a skillet with a bit of olive oil, and those 4-6 cups of greens (2-3 servings) will cook down to a small portion in no time. I love packing power salads or grain bowls for lunch, which are easy to load up with a lot of veggies. 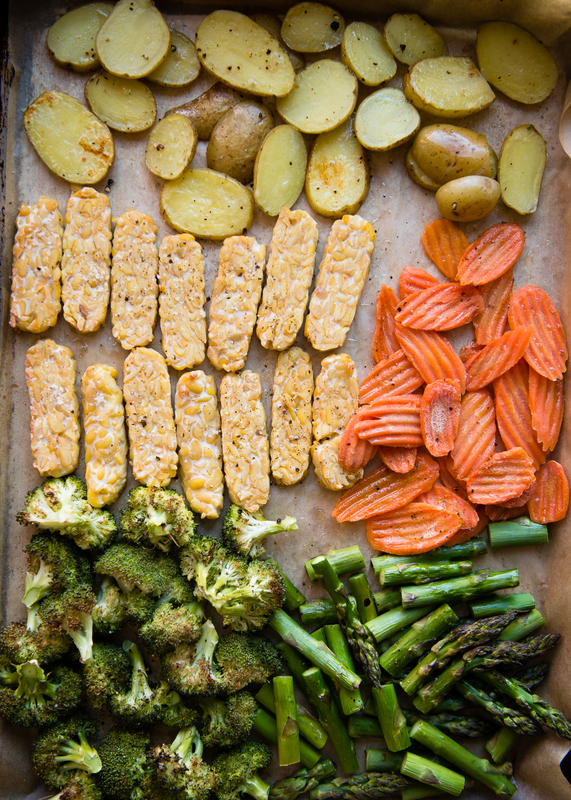 One of my favorite tricks is to use a sheet-pan to roast up a bunch of veggies and some protein (chickpeas or marinated tofu, for example) on Sunday, and use those to layer into salads or bowls during the week. It’s also a great idea to pack extra veggies or a side salad alongside your lunch, if your lunch isn’t naturally vegetable heavy. There’s only so many vegetables you can stuff into a sandwich, ya know? Again, sheet-pan dinners with a good amount of vegetables per serving is an easy way to make sure you’re getting those 8 servings per day. 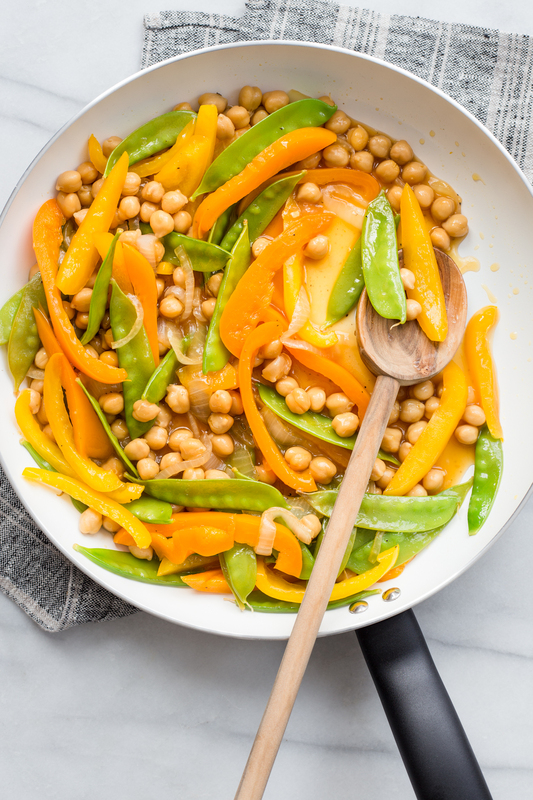 Veggie-loaded stir-fries work well, and you can always replace the starches in your meals with vegetable noodles (or go 50/50 vegetable and regular noodles) to get in some extra veg. I like to put out a plate of raw veggies or a big salad to go alongside dinner, and often times we do a sort of “salad bar” dinner where we put out the fixings for mega salad bowls and then everyone builds their own. One of my snacking rules is that it should always be a combination of protein and produce. 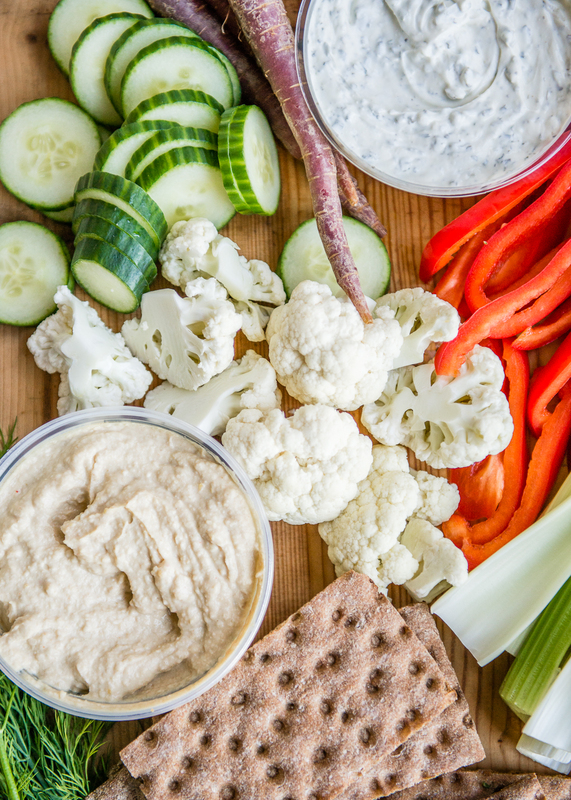 A platter of raw veggies with a bowl of hummus or bean dip for dipping will do the trick, as would celery sticks or with peanut butter, sliced red pepper with some cheese, or some cucumber slices and cottage cheese. Include vegetables at every snack is an easy way to add an extra 1-2 servings of vegetables to your diet each day.